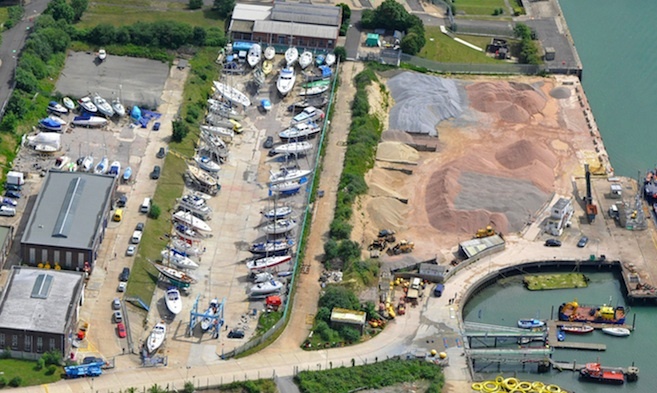 The Cowes Harbour Services Boatyard site at Kingston Wharf is home to a wide range of onsite independent businesses, many happy to serve the clients in the Boatyard, as well as a diverse collection of other businesses helping East Cowes thrive. We hope, in the near future, to be able to expand our number of businesses on-site; if you think that Kingston Wharf would suit your business please do Contact Us. Unit 2. 1st Class Covers specialises in marine (boat interiors and exteriors), automotive (interiors of cars, convertibles, and camper vans), also motorbikes, and all domestic and commercial upholstery and cover work. Billy White's business 1st Class Covers has grown rapidly over the last few years and so the recent move to a larger workshop at Kingston Wharf makes perfect sense. Unit 2a. DFM Joinery, Dave Munt’s business, specialises in period, listed and modern purpose-made joinery and bespoke quality yacht joinery. Dave has a wide portfolio including, sash windows, oak framing, conservatories, kitchens, and custom staircases. Units 3, 4 and 6. Island RIBs Ltd are designers and manufacturers of Rigid Inflatable Boats. Designer Brian Hallett and business partner Alex Cottle manufacture RIBs from 6.5m to 10m length with flexible configurations of cabins, consoles and cuddies. Coding to MCA Cat2. Their customers include both commercial operators and leisure users. Unit 7. Islandwide Marine offers a wide range of engineering services from spares, repairs, servicing, fault finding to full installations of all makes and models of inboards and outboards. Owner Rob Kitcher has over 30 years’ experience in the marine industry and offers a 24-hour call-out service across the Island with a fully fitted out van, backed up with full workshop facilities at Cowes Harbour Services Boatyard. Islandwide Marine is also Sea Start approved. Unit 8. Alpaca Wraps is owned by Mike Pack, delivering a specialist marine and vehicle wrapping service. The team has over five years' experience within the marine sector and are experts in boat wraps, boat names, stripes and general boat branding/graphics as well as interior wraps. With 14 years' experience in vehicle wrapping and branding the team can offer various types of wraps from whole vehicle wraps to custom branding. Also interiors and windows. Unit 9. Cowes Sailmakers has just opened up at Kingston, moving into the mezzanine in the main Kingston Marine Services building. Owner Richard Martch brings 30 years' experience in sail making to the business and as well as providing a comprehensive repairs service, he will be making new sails for classic, cruising and racing yachts. Unit 10. Nigel R Harrison Yacht Surveys. Nigel has taken the small unit at the bottom of the yard, right by the hoist dock making him difficult to miss for any boats coming ashore here. Nigel offers marine surveys, from pre-purchase and insurance, to damage and new craft delivery inspections as well as consultancy and project management and brings a wealth of experience to bear in all matters maritime. Unit 10. Island Yacht Refinishing. Simon Hopwood offers the following services: topsides and superstructure resprays; varnishing; structural and cosmetic fibreglass and gelcoat repairs; anti-foul removal; application of epoxy coatings; osmosis treatments and prevention; polishing and valeting. Isle of Wight Fuels are owners of the Island’s only fuel oil storage terminal, located at Kingston Wharf. Over 90% of the petrol and diesel sold on the Island comes through this facility, which is transferred directly by pipeline to the fuel storage depot next door in Kingston Road.